Introducing the FUJIFILM X-T30 mirrorless camera and the FUJINON XF16mmF2.8 R WR lens - setting new standards in compact and lightweight photography gear. Hot on the heels of the company’s highly successful X-T3 launch, the brand new, highly anticipated FUJIFILM X-T30 mirrorless digital camera will be available for sale on New Zealand shores from March 20th 2019. Pitched as a powerful companion for any photographer – beginners through to the enthusiast – it’s the latest addition to the X Series range of cameras, renowned for outstanding image quality, proprietary colour reproduction technology and intuitive dial-based handling. “We’re calling this powerful little unit the ‘all-rounder’. It will appeal to a broad range of users from enthusiast photographers to first time beginners,” says Craig Robertson, professional photographer and FUJIFILM’s NZ X Series specialist. The X-T30 is equipped with a host of new functions offering outstanding performance, utilising the 4th Generation image sensor and processor with 26.1 megapixel resolution and fast high-performance AF. In addition, phase detection pixels are now across the entire frame (100%). Other advanced features include a joystick for shifting focus points easily, a new intuitive touch-screen panel with improved response, and an improved body design that offers better holding stability to ensure comfortable shooting even with larger lenses. “Fujifilm cameras are known the world over for being lighter and more compact without compromising quality. The X-T30 is no different and we’re proud to say gone are the days of lugging heavy DSLR gear around,” says Craig. An improved algorithm delivers even more advanced AF-tracking performance. This includes enhanced accuracy in face / eye detection and the introduction of a Face Select function to provide priority auto-focus on a selected subject. The evolution of AF performance is available with both still photos and during video filming. Improved exposure stability during face / eye AF and face recognition in the AF-C (continuous AF) mode adds to ease of use. Video performance itself has also been enhanced, offering high-resolution audio recording and smooth 4K/30P video recording. Coupled with the launch of the X-T30, FUJIFILM will add to its X Series line-up of interchangeable lenses with the release of the new FUJINON XF16mmF2.8 R WR to compliment the other compact prime lenses. Also available in New Zealand from March 20th 2019, this lens features a focal length equivalent to 24mm (in the 35mm format) and has a maximum aperture of F2.8. “The XF16mmF2.8 lens is small and lightweight. Its inner focusing system is fast and quiet and is perfect for travel and landscape photographers,” says Craig. The FUJINON XF16mmF2.8 R WR lens in black (and silver from April) has an indicative price of $699. 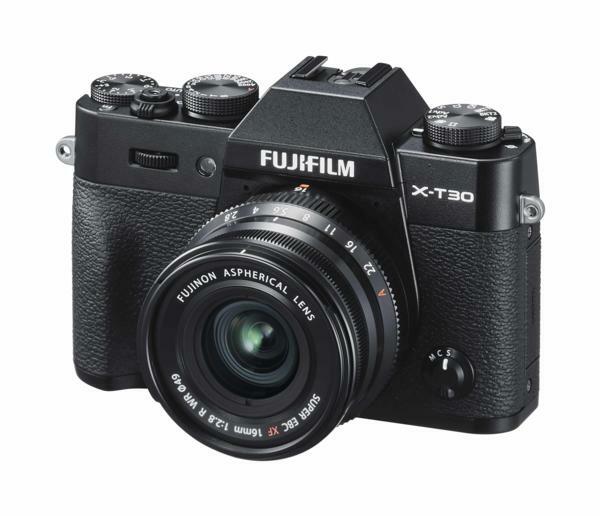 The FUJIFILM X-T30 has an indicative price of $1,649 (body only) and will be available in black, silver and charcoal silver. Both can be purchased from authorised FUJIFILM dealers nationwide from March 20th 2019.